Use our step by step instructions below for processing your electronic government remittances or, follow along with our government remittance training videos. 1. Launch Telpay for Business. 3. Select 'a Provincial or Federal Government Agency' and then click 'Next'. 4. Under 'Search biller by:' select 'Biller Name'. Type "CRA" in the search field and click 'Find'. 5. 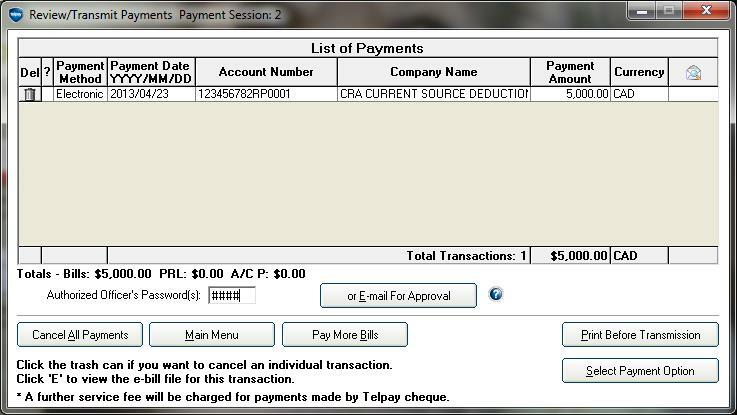 Select 'CRA Current Source Deductions'. A Biller Details window will open; select "close'. 6. 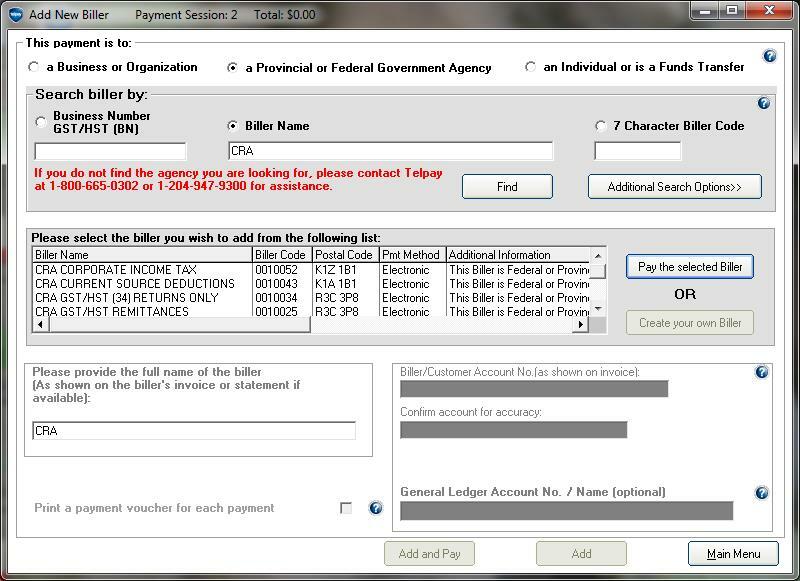 Click 'Pay the selected Biller'. 7. Enter your Biller/Customer Account No. (as shown on invoice). In the field below re-enter the Biller/Customer Account No. for accuracy. 8. Enter your General Ledger Account No. / Name (optional). 9. Click 'Add and Pay'. 10. 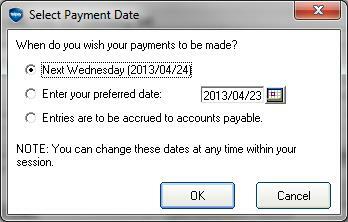 Select the payment date and click 'OK'. 11. 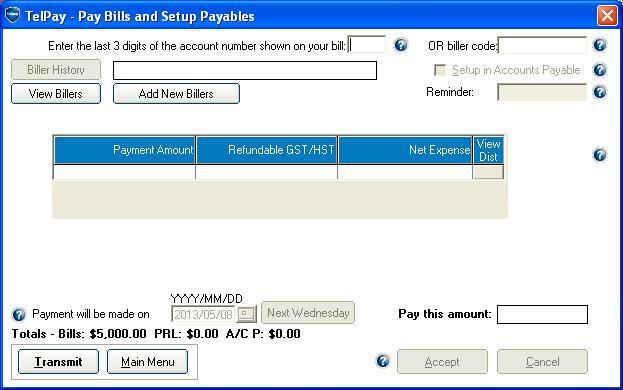 In the 'Pay Bills and Setup Payables' screen enter the Payment Amount, and enter “zero” in the 'Refundable GST/HST' field. 12.Then click on the field "View Dist', click 'Accept' on the Distribution Details screen. 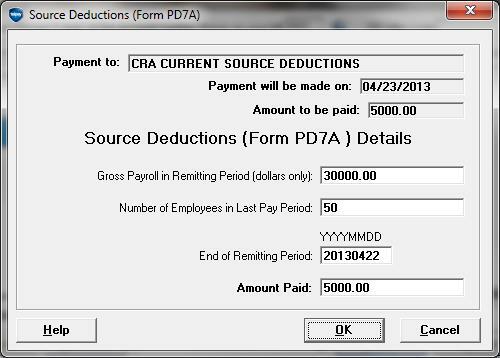 13.Click 'Accept' and complete the Source Deductions (Form PD7A) that pops up. Click 'OK'. 14. 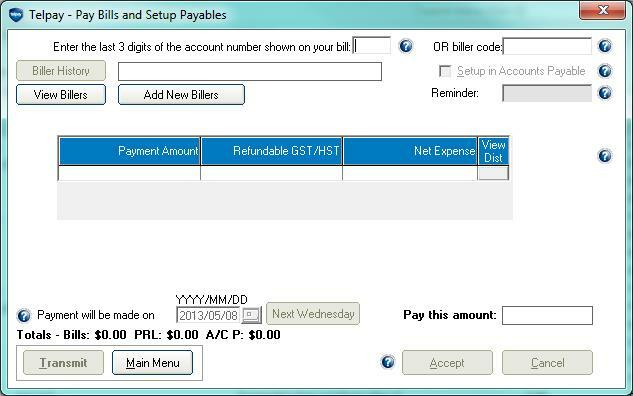 In the 'Pay Bills and Setup Payables' screen click on the 'Transmit' button at the bottom of the window. 15.Enter the authorized officer’s password or click 'E-mail for Approval' to receive payment authorization. Click 'Select Payment Option'. 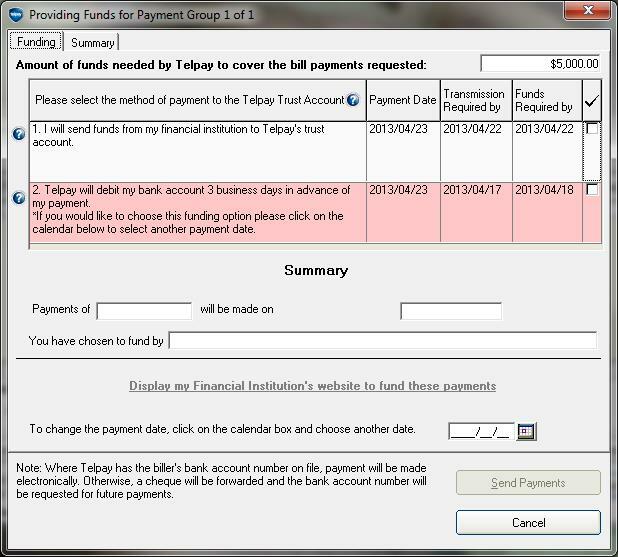 16.Select your funding option and click 'Send Payments' to finish sending your CRA Payment. 17. Once your system has successfully connected to Telpay, you will receive a Transmission Report which you can print or continue. This report will be stored in the history of your Telpay for Business software. 18. You will then be required to back up your system. Select a network drive or an external drive. 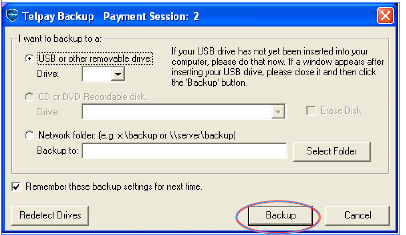 Then click 'Backup'.